For the second smoothie in this series, I give you a creamy and delicious vegan-friendly twist on a mango lassi (sans yogurt). 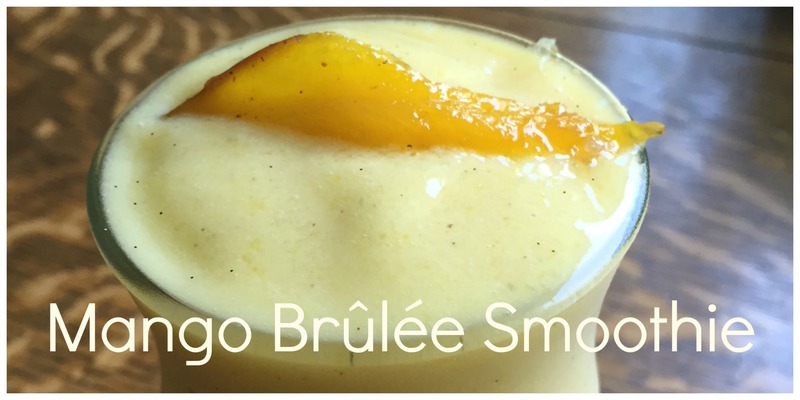 Caramelized pieces of ripe mango add a rich depth of flavor, coconut milk and banana provide a much needed creaminess, lime and a pinch of cardamom brighten up and round out this dream of a drink. Salivating yet? Try it yourself! 1. Turn oven on to broil. Cut and pit mango, keeping the skin on. Score the mango and sprinkle the sugar on top. Broil until the sugar is bubbling and amber in color. Remove from oven and allow to cool for five minutes. 2. Scoop/scrape the mango off of its skin, and dump it along with all of the other ingredients into the blender and blend until smooth. 3. Pour into a tall glass or two, garnish with a slice of mango (optional) and enjoy!